In 1911 Farming supplied 8.1% of all jobs. In 2000 this had fallen to 1.1%. Fifty years ago, the Ayrshire and Shorthorn cows were equal queens in the dairy, with their black and white Friesian sister only just beginning to make her mark. 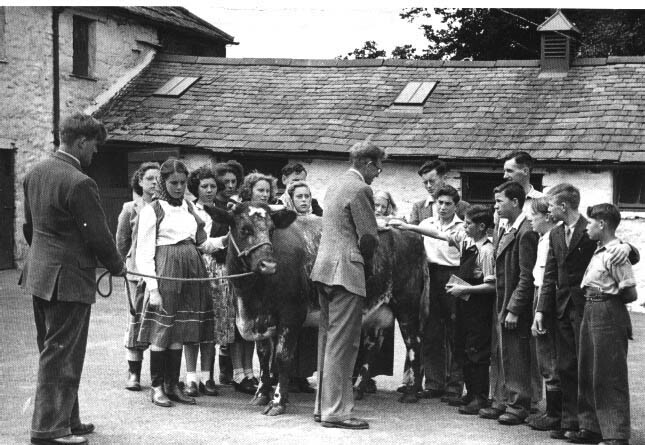 Left: A school party makes the acquaintance of a Shorthorn cow at Newton Rigg in 1951. 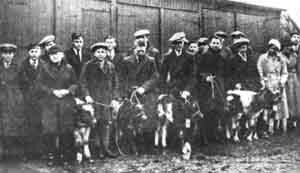 Right: Penrith Young Farmers' Calf Rearing Club collect their calves to rear for a year from Newton Rigg Farm School: 7th March 1936. In the mid 20th century French cattle and sheep were only beginning to be heard of. 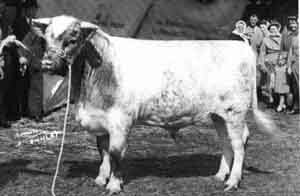 The beef cow was likely to be a Blue-Grey cross from Scotland (Shorthorn x Galloway), or a placid Hereford, rather than a Charolais or Limousin. It is this early period that is best represented in the Countryside Museum: the era of the horse, and the implements that he powered, before the tractor came to take his place; the era when farms still needed large numbers of people. Although the work was harder than it is today, it was more companionable and less bureaucratic. There are mixed farming practices across the county as a result of the variety of land, but the hill farms have only one staple crop - the summer grass. They rely on livestock as their main income generators. These fells are the home of hardy sheep, the Herdwick, Swaledale or Rough Fell breeds, either bred true or crossbred with a meat "tup" such as the Texel, Leicester or Suffolk. The "Mule" sheep was well-known as a prolific product of the cross out of the hardy Swaledale or Rough Fell ewe by the Border Leicester ram. In the 21st C the older breeds of cattle, such as the Shorthorn, have been replaced with crossbred cattle, mainly from the Friesian or Friesian-Holstein dairy cow. They are crossed with the Limousin, Charolais, Blonde d'Aquitaine or occasionally still the good red Hereford bull. These crossbred cows are bred to a similar beef bull to produce suckled beef cattle. But as ever, all the hill farmers' energies are devoted to a good lamb crop, a safe calving, a quick clipping time and the saving of as much grass for winter as possible. Sheep and cattle may be "turned to the fell" in May to allow the grass on "in-bye" land around the farm to grow. Hay is still made in small bales but a great deal is now more quickly saved as round-bale silage and wrapped in plastic sheeting. Bedding is frequently bought from "ower t'top" - over the Pennines in Northumberland, Durham, or Yorkshire where the summers are often drier and the arable farms have wheat or barley straw to spare. 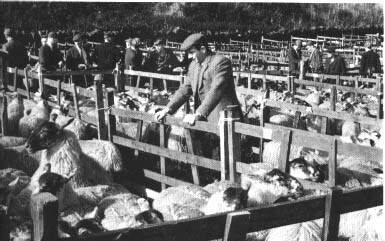 Left: "Mule" ewes for auction at Lazonby Mart, 1969. Lowland farms in Cumbria are seldom totally arable but their dairy cattle are mainly the Holstein-Friesian and as well as good grass the fields grow barley, root crops, occasionally oats and increasingly maize for silage winter feed. Their sheep are more likely to be crossbreds - Greyfaces or Mules by the Leicester out of a Swaledale or Rough Fell ewe. All the local farms rely heavily on mechanical equipment, which is beginning to include computers, to help in their daily life. The farm no longer has the economic power to support a large staff and there are increasing sheaves of paperwork to be dealt with to comply with European regulations. Farmers still work long hard hours with very little time off. Their neighbours pass by on 4 wheeler motorbikes, in cars or on tractors, and social interaction is cut down to a brief wave, so their lives are becoming increasingly solitary.